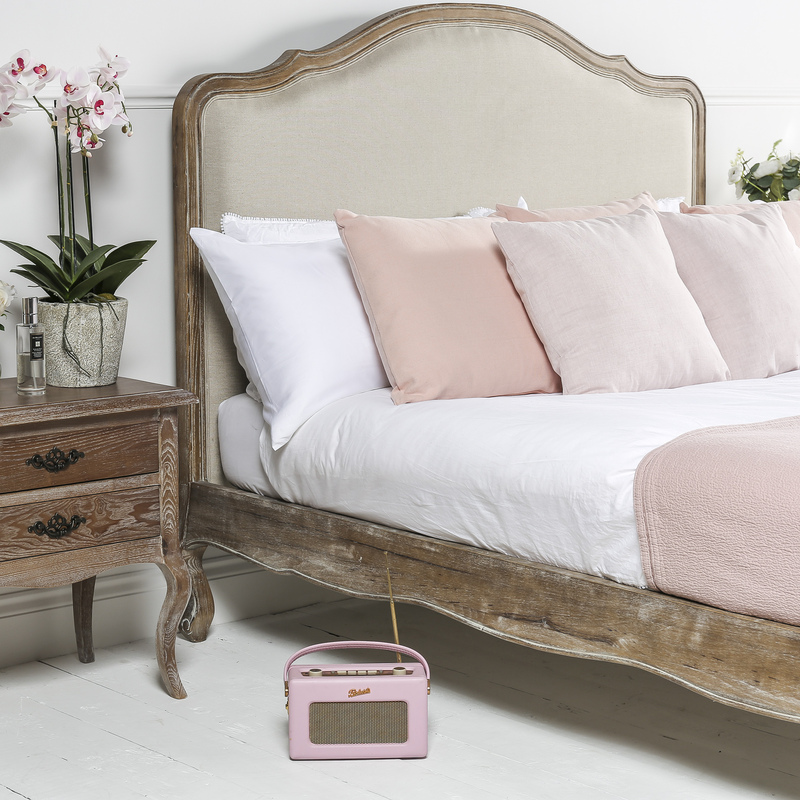 The hallmarks of French neoclassical design understated elegance and fine, exposed white wash Ash wood are showcased in our sumptuous upholstered French style bed. 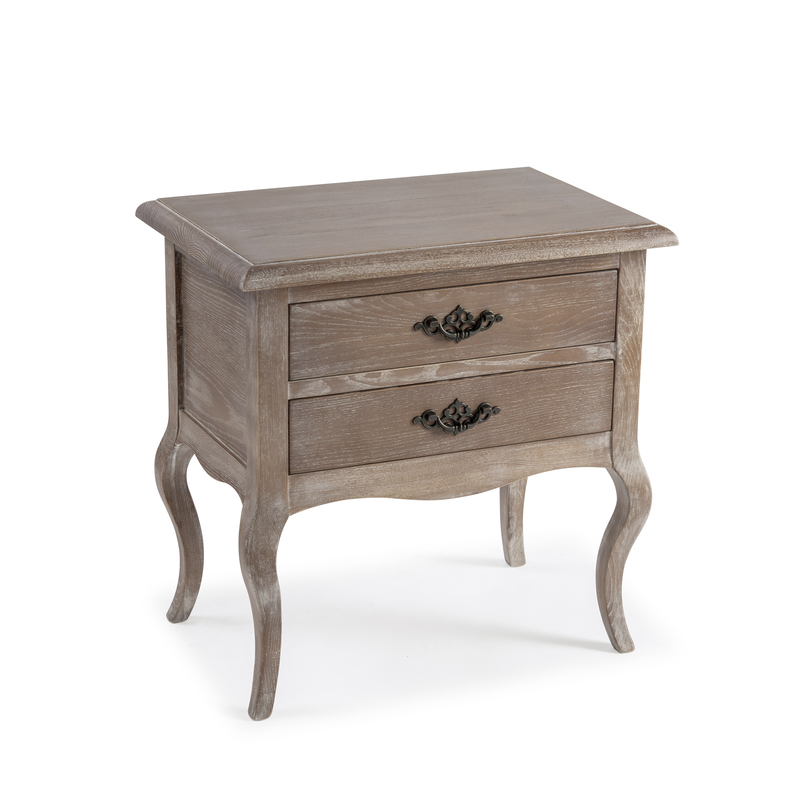 Handcrafted in solid Ash with a limed oak finish, it features classical hand-carved details and is richly upholstered in a Oat Meal Belgium linen fabric. 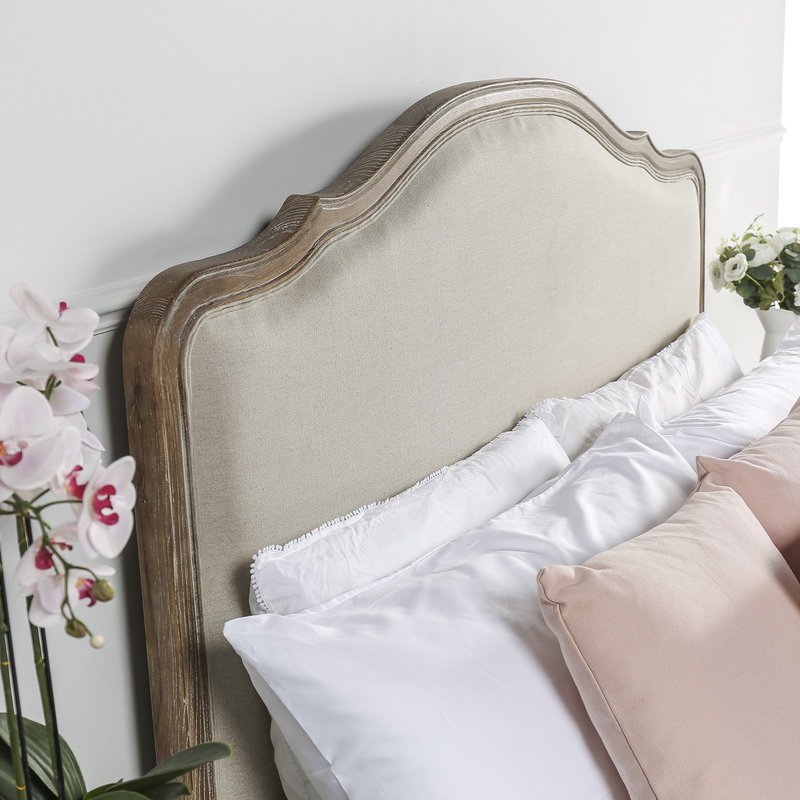 Features a sprung slatted base for ultimate support. 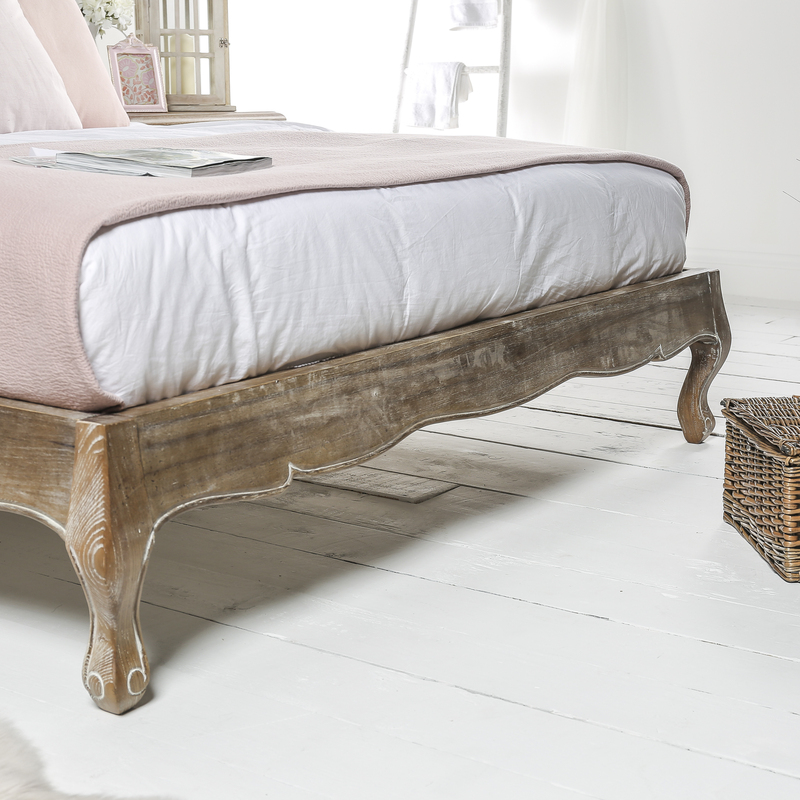 Formed with cabriole French style legs and a carved headboard. Features a low foot end to benefit smaller bedrooms. This listing is for the bed frame only, no mattress is supplied. 1-Man Deliveries: Usually delivered within 7 days of order being placed*. Our 1 man delivery couriers offer a tracked express delivery service on our smaller items that are delivered within 2 business days of being dispatched from our warehouses, we will contact customers to arrange delivery on the weekday of the customers choice, once the goods have been dispatched the courier will email the customer on the morning of delivery with a delivery time slot. Please Note: This service is only offered to mainland England, Wales and Southern Scotland (appearing as Green and Yellow on the map). This delivery service is to the front door/ground floor entrance of the property only. Pallet Deliveries: Usually delivered within 7 days of order being placed*. Our pallet delivery couriers offer an express delivery service on our palletised items that are delivered within the next business day after being dispatched from our warehouses, we will contact customers to arrange delivery on the weekday of the customers choice, on the day of delivery it is requested that the delivery driver contacts the customer 1 hour before delivery (although this may not always be possible). Please Note: This service is only offered to mainland England, Wales and Southern Scotland (appearing as Green and Yellow on the map). This delivery service is to curbside of the property and the customer is responsible for disposing of the pallet. Visit the deliveries page to find out more. 2-Man Delivery Details: Usually delivered within 14 days of order being placed* **. Grosvenor Beds offer 2-man deliveries of our larger items and are aimed to be delivered within 7-14 business days of the order being placed (during busier periods this can be upto 21 business days but Grosvenor Beds will notify you via email if this is the case), once the order has been received Grosvenor Beds will contact the customer to inform them of the earliest possible delivery date, once this date has been confirmed by the customer our couriers will contact the customer directly to offer a delivery time slot and time slot. On the day of delivery the goods will be taken through to the room specified by the customer (please note that this does not include assembly of goods or the removal of packaging). Please Note: This delivery service is only offered to the UK mainland in the areas highlighted in Green on the map, also once delivery has been confirmed between the customer and our couriers the customer must ensure that they are able to accept the delivery as any changes, failed deliveries or cancellations will be subject to a £45 surcharge. If unsure if an item will fit into your property please contact us before the item is dispatched so that we can confirm the dimensions of the largest pieces as any delivery resulting in the return of the item due to it not fitting into the property will be seen as a failed delivery and subject to a £45 surcharge. – Finance is available on orders of £595 and over. – 10% Deposit is required for our finance options. – 12 Month 0% Finance is available on all orders . Read the full details here on our V12 Page.